It's this time of the year again! 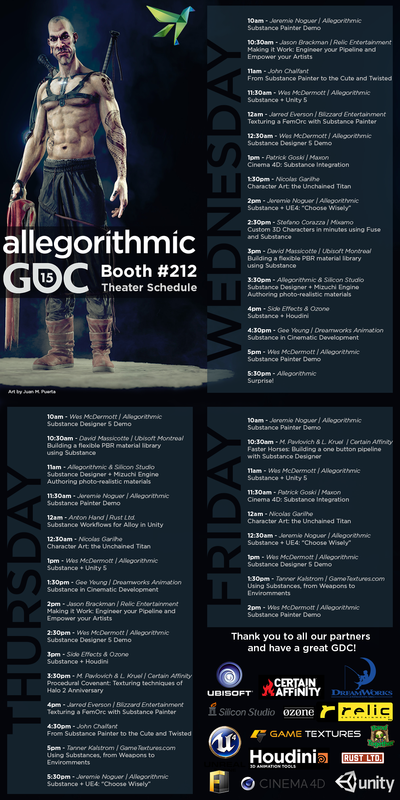 All the gaming industry is flying to San Francisco for GDC, and like every year, Allegorithmic will be there too! Come and see us at Booth #212. We will be showing the all new Substance Designer 5 and Substance Painter 1.3 and a great lineup of Special Guests will be showcasing awesome Substance fueled workflows and games! Cool, will there be a live stream of this? Wow that's what I call a schedule ! am I reading Substance+Houdini !?! Muezli.com with yoghurt and lots of fresh fruits. Honestly, depending to how deep is the integration, this could be a game changer in video game pipeline ! Please say you are recording these sessions!!!! The AllegoDays ! or AllegoCon ! I've been really impressed with the demos at GDC. Great lineup/organization. Keep up the great work guys! Alexandre - I know it's too late for this now, but in the future these things can be easily recorded without any concern regarding the traffic in the booth.. you merely need to have a capture device recording the feed from the presenter's computer, and a feed from his microphone into a decent audio field recorder. Then, just pull the two feeds together into an NLE, synchronize, export, and publish. Sure it won't be cutting edge production value, but the presenter's screen will be clearly visible, and their explanations clearly heard... this is all we need / want.